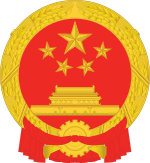 The Ministry of Finance (Chinese: 财政部; pinyin: Cáizhèng bù) of the Government of the People's Republic of China is the national executive agency of the Central People's Government which administers macroeconomic policies and the national annual budget. It also handles fiscal policy, economic regulations and government expenditure for the state. The ministry also records and publishes annual macroeconomic data on China's economy. This includes information such as previous economic growth rates in China, central government debt and borrowing and many other indicators regarding the Chinese economy. The Ministry of Finance's remit is smaller than its counterparts in many other states. Macroeconomic management is primarily handled by the National Development and Reform Commission (NDRC). State-owned industries are the responsibility of the State-owned Assets Supervision and Administration Commission, and there are separate regulators for banking, insurance and securities. It also does not handle regulation of the money markets or interest rates. These, together with other aspects of monetary policy, are governed by the People's Bank of China (PBC), China's central bank. The Ministry, NDRC and PBC are equal in status, with their political heads all sitting on the State Council. 1. Economic and public finance policies Formulating and implementing strategies, policies and guidelines for economic development, public finance for government revenue sharing between the central and provincial governments. 2. Administration of public finance and external debt Draft laws and regulations on public finance, financial, accounting management, external finance and debts. 4. Revenue and Tax legislation reforms Proposing tax legislation plans - reviewing proposals on tax legislation and tax revenue regulations. 8. Social Security Expenditure Managing the social security expenditures from the central government; formulating the accounting management rules on social security funds; monitoring the utilization of the social security funds. 10. Accounting Regulations Formulating and implementing accounting regulations - for government and private corporations and promoting accountability and transparency. 11. Fiscal and Tax Policies Monitoring the implementation of fiscal and tax policies - laws and regulations, examining problems with the system and making changes. 12. Fiscal research and education Research into fiscal policy and education resources to the wider community. 13. Other Duties as Directed Undertaking other assignments of the State Council.